Cats are in for the biggest treat of their lives too. If you believed until now that only dogs deserve treats and that only dogs can be trained, you are gravely mistaken. Cats need training too and for that, you’re going to need some tasty treats for motivation. That’s where you can take advantage of the Instinct Raw Boost Minis cat treats. Get them at $1.50 off at your local retailer with the coupon (expired – new coupons below). Simply print and cut the coupon available directly from the manufacturer’s website. 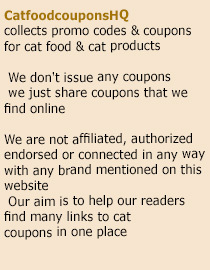 Use only original coupons when claiming as stores honors only those. The Instinct Raw Boost Minis cat treat coupons are only valid until April 30. Download your coupon today. Instinct Raw Boost Minis are freeze-dried raw treats perfect for your cats. Made of all-pure and all-natural ingredients, cats will taste the real flavor of turkey and chicken with every bite. Made in the USA, these cat treats are guaranteed to be healthy and delicious. Give your pets the treatment that they deserve. Reward a good behavior with Instinct Raw Boost Minis. Train cats with proper motivation. And very soon, you’ll have yourself a well-behaved that pet you’ll love twice as much! Nature’s Variety offers a $3 off coupon at their website. All you have to do is fill out a form at this page and they’ll send you a $3 off coupon via email. This entry was posted in Nature's Variety. Bookmark the permalink.